For a discussion on the global economy, watch the Global Economic Outlook session from the World Economic Forum's Annual Meeting 2017. What is competitiveness? There are actually a number of definitions out there. The World Economic Forum, which has been measuring competitiveness among countries since 1979, defines it as “the set of institutions, policies and factors that determine the level of productivity of a country”. Others are subtly different but all generally use the word “productivity”. Generally, the world is getting better and better at measuring things, but nonetheless there are always black-spots in any benchmarking exercise. Despite our best efforts, we still haven’t found a fail-safe way of including a country’s environmental record into its competitiveness score. Nor do we attempt to measure whether, or to what degree, competitiveness makes people happy, although there are others that do attempt to measure this. Does a country that is competitive mean it is best able to face the future? Again, the answer is yes and no: some countries are investing for the onset of the Fourth Industrial Revolution in ways that we have not yet found a reliable way of measuring. This last area is a focus of considerable work here these days. Aside from some countries going up and others going down, this year’s set of data gives us insight into three areas that continue to be important to policy-makers in 2016. With the debate on globalization becoming increasingly politicized, with opponents blaming it for increasing levels of inequality and offshoring of manufacturing jobs, and proponents emphasizing the role it has played in raising millions of people out of poverty, we actually find that countries’ openness when it comes to trading goods and services with one another has been declining steadily, if slowly, for the past 10 years. With openness directly linked to economic growth, this seems significant, especially as the trend seems to stem mainly from the encroachment of non-tariff barriers, which are subtle and often hard to detect. With every advanced economy having undergone some form of monetary stimulus such as quantitative easing since the great recession, the report also helps us understand why some countries have been more effective than others in reigniting sustained growth. By comparing the competitiveness of those economies that have engaged in monetary stimulus programmes over this period, we find that those with high competitiveness scores were more successful in driving economic growth than others with lower scores, even if the latter have expanded their central bank balance sheets by a greater amount. The report offers insight into how priorities may be shifting for nations in earlier stages of development. 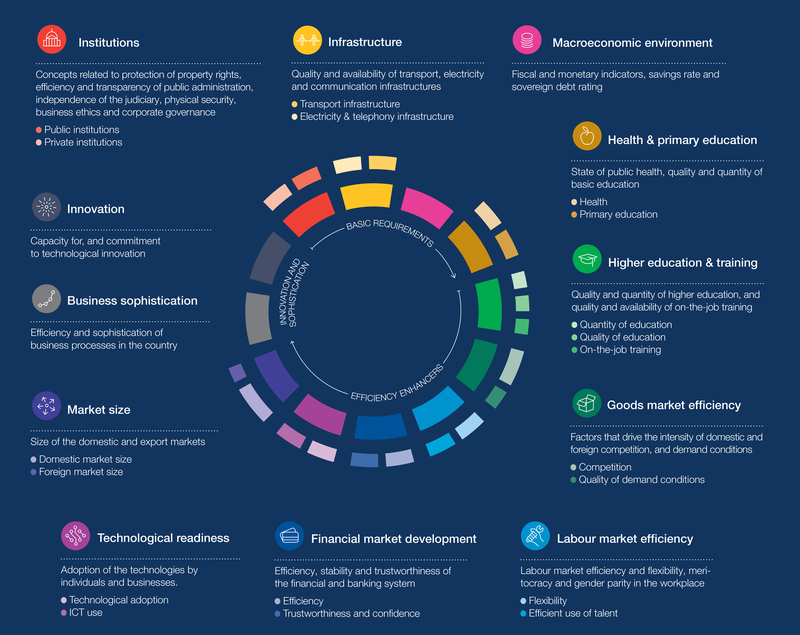 While basic drivers of competitiveness such as infrastructure, health, education and well-functioning markets will always be important, data in the report suggests that a nation’s performance in terms of technological readiness, business sophistication and innovation is now as important in driving competitiveness and growth. This is important for policy-makers and leaders in emerging markets who need to be aware that the reality when it comes to helping move their economy up the income ladder is much more nuanced than they may have previously believed.